A unique way to play guitar wherever and whenever you want to. SRT Powered is a new system designed to recreate the body resonance of an acoustic guitar in a bodiless guitar. Yamaha developed SRT Powered, collaborating with recording artists to create a system tailored to the unique properties of the SLG body and modelled after the tones of a high-end Yamaha acoustic guitar captured using a carefully selected microphone in a professional recording studio environment. By actually reproducing the sound of an acoustic guitar—right down to its natural sustain and decay—Yamaha lets guitarists experience the genuine body resonance, body tone and ambience of an acoustic guitar. The detachable top section of SLG’s frame means that practicality and portability are way beyond that of a conventional guitar. The luxury gig bag provided can be carried with ease and fits into an aircraft overhead compartment with room to spare. With the SLG, Yamaha set out to bring a modern feel to the classic contours of a conventional guitar. 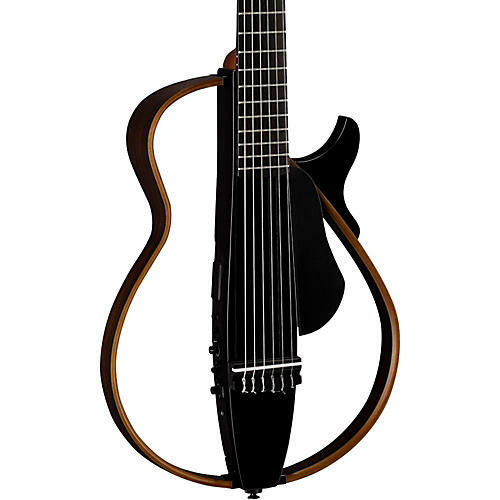 The distinctive design that emerged is the result of a collaborative effort between the project team and the Yamaha Design Laboratory, and combines traditional guitar lines with an innovative form unlike that of any guitar before it. The bodiless design of the SLG offers a natural, quiet sound that allows guitarists to play without disturbing others, whether practicing late at night or playing in the living room when family members are home. The SLG200N is ninety-percent quieter than a conventional classical guitar. Yamaha’s SLG features excellent durability owing to its solid body structure, so users do not have to worry about damaging the instrument when playing live or traveling. Both the steel string and nylon string models are fitted with a dual-action truss rod, allowing both convex and concave bow to be adjusted. Connect to an external music player to enjoy music playback, enhance your playing with a range of authentic effects, or plug-in headphones to enjoy playing in privacy—the SLG offers a variety of functions that make playing even more enjoyable. What's more, SLG comes with a built-in precision chromatic tuner, compatibility with both battery-and AC power, and a range of other user-friendly features. Order this fantastic, one-of-a-kind guitar today!